The Dashboard provides access to a wide variety of templates, categorised according to their intended use. 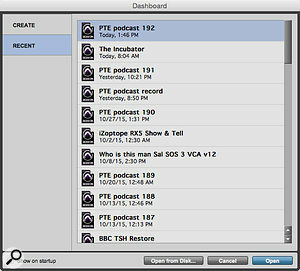 The Dashboard in Pro Tools 12 is the perfect jumping-off point for new and existing projects. 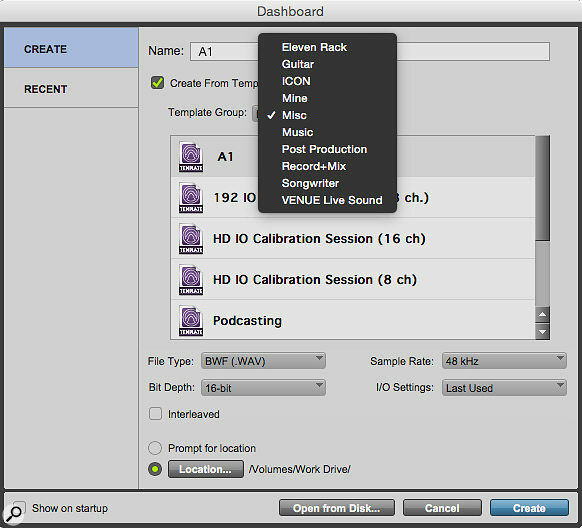 Over the last few months, we have been looking at the features that Avid have added in Pro Tools 12, 12.1 and 12.2. 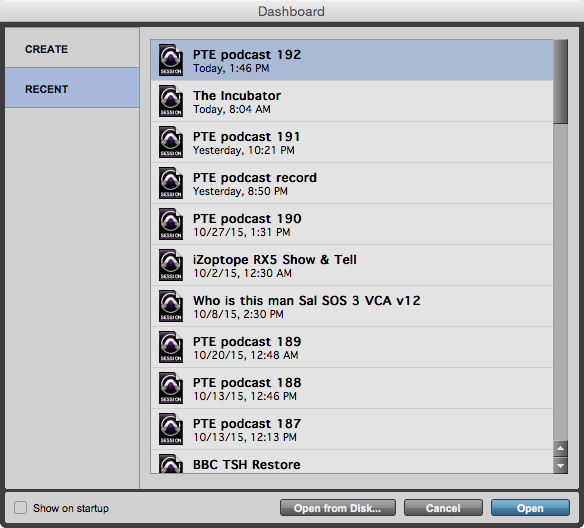 This month, we’ll examine the new Dashboard window introduced in Pro Tools 12. This provides a starting point for creating new sessions from scratch or from a template, and opening recent sessions. When you don’t use the Dashboard, it is very easy to name a new session and click the Save button without configuring the Session Parameters, then forget where on the system you have just saved your new session. Successive versions of Pro Tools have made it a little harder to ignore the session settings, but even now, they are not always obvious. It is still alarmingly easy to pass them by, but I cannot stress enough that these are very important parameters — and if you set them up wrongly, you might not realise there’s a problem until much further down the line, when it will be much harder to rectify. So my advice is to spend some time carefully making sure you have your session settings correct when creating new sessions. It is worth it! Let’s start with creating a blank session. From the Dashboard, choose Create from the options in the top left-hand corner of the window; the middle section should be greyed out and the Create From Template box unticked. Below the greyed-out box are the all-important session settings. 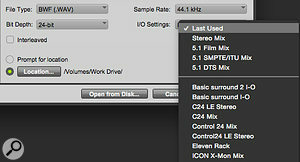 The Audio File Type determines the file type for all audio files created by Pro Tools for this session. These days I can see little if any reason to use any file type other than BWF (WAV) unless there is a need for compatibility with Avid’s Media Composer and legacy systems, in which case AIFF is available. The options offered by the Sample Rate drop-down menu will depend on what hardware you have. My example screens show what you get on an HDX rig with an HD Omni and 8x8x8 attached. For any sort of broadcast project, 48kHz or one of its multiples is likely to be the best option; for music, the choice is perhaps less important. When it comes to Bit Depth, there’s really no reason to use 16-bit any more, so the choice is between 24-bit and 32-bit float. There is no difference in terms of the quality of source recordings you can capture. Using 32-bit files can avoid clipping or unnecessary dithering with AudioSuite rendering, and can help avoid rounding errors in signal processing, but takes up more disk space and audio streaming bandwidth, which can be problematic when using slower hard drives. If you would like to understand more about bit depth and dither, I recommend a great video by Paul Maunder (www.youtube.com/watch?v=_pBdcYiEuqY) which explains the issues very clearly. The Dashboard will offer a range of default I/O Settings You can select from different I/O Settings as a starting point when creating a session., and selecting I/O from the Setup menu will let you choose your own. For much more detail on configuring your own I/O setups, see the Pro Tools workshop articles in the June 2014 and October 2015 issues. The latter covered the changes introduced in Pro Tools 12, which saw the system settings separated from the session settings, making it much easier to open sessions created on other systems. You can also now choose whether multi-channel (including stereo) files should be interleaved or not. An interleaved file combines all the source tracks into a single file, rather than creating separate mono files. For a long time, Pro Tools did not support interleaved files, so I suspect this option to use non-interleaved files is still there for legacy reasons. My advice would be to always enable the Interleaved option these days. The Dashboard lets you specify a default location on your system where Pro Tools will always save new sessions. If you have one drive that you use to store all your work in progress, then enabling this option and setting it to that drive will help you not lose your work. However, if you have a number of media drives, I recommend leaving the ‘Prompt for location’ option enabled, so Pro Tools will ask you to select where on your system you would like to save your project. Depending on your operating system and what you did on your computer prior to creating a session, this window can present different locations on your system, so take the time to check you’re in the right place before hitting Create. Are you fed up of creating the same tracks over and over again whenever you start a new project? Template sessions can be a really useful way of building up a stock of ready-to-use session layouts. I often create a template session at the planning stage before I start an album project, as there will often be a lot of tracks and instruments that are the same for every song on an album. I create a template session with all the tracks I expect to need with the appropriate plug-ins in place, and provisional plug-in settings too. I also include headphone monitoring paths for performers and track groups, in fact all the things I can anticipate needing for each track’s session. This saves time in the recording sessions and also provides consistency across a project. Template sessions can also include media such as audio, video and MIDI files. This is really useful if you have common media content in a session; for instance, every episode of a radio or TV series might use the same jingles, idents, signature tune and so on, while you might employ the same samples in multiple songs across a music project. If you are deriving your template from an existing session, make sure you work on a copy of the session and clear out of the Clip List everything that you don’t want to include, so all that is left is the media you want in the template. Avid supply a range of factory template sessions for a wide variety of different genres and project types. I also have a ‘Mine’ folder that I have created with my own session templates in it. To create a session from a template, first choose the Create option and then make sure that the Create From Template option is enabled. The central box will no longer be greyed out and you can navigate around the templates that are already on your system. Notice now the session settings are set for you based on what was chosen when the template was created, though you can change any of the session settings if you like to before you create the new session. Once you are happy — and do double-check everything, as it is a lot easier to make changes at this stage — you can choose the location to save this new template-based session and you are ready to go. It is also possible to use the Dashboard to open sessions that you have opened before on your system, and it provides a much longer list of recent projects than the Open Recent option in the File menu. The Dashboard offers a much longer list of recent projects than the File menu’s Open Recent option. Any time you need to access the Dashboard, you can do so from the Create New option in the File menu. By default, it also appears every time you boot Pro Tools. This can be changed either from the Show On Startup option in the bottom left-hand corner of the Dashboard, or in the Warnings & Dialogs section of the Display Preferences page.